A proven self defense round, the Hydra-Shok 9mm 124 grain jacketed hollow point from Federal Premium is a stalwart in the self-defense offerings for 9mm ammunition. They are perennially among the best producers for high end self-defense ammunition because they have proven engineering and value added components. A nickel plated brass casing with a Boxer primer offers clean easy feeding and extraction with the potential to be reloaded, while the obvious component part hat puts it in the top contenders is the Hydra Shok bullet. 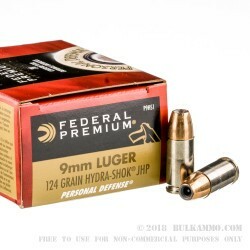 124 grain weight is a good middle ground for the 9mm and allows for a 1120 muzzle velocity, and offers good penetration and proven stopping power. The powder is noticeably cleaner burning than comparable rounds and the projectile has been around since 1988 virtually unchanged. That speaks volumes to the capacity of this hollow point design and the expansion properties. Countless ballistic gelatin tests have been done form the FBI lab to the popular you tube channel; Hydra-Shok is consistently a top performer. Suitable for any firearm that needs premium ammunition for self-defense in 9mm. Excellent conceal carry/personal protection ammo. 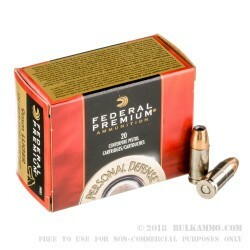 Q: What advantages does this ammo have over the less expensive: 50 Rounds of 9mm Ammo by Federal LE - 115gr +P JHP (http://www.bulkammo.com/bulk-9mm-ammo-9mm115jhpbplefed-50) Both are hollow points. Also can these cases be reloaded? A: Both cases can be reloaded. 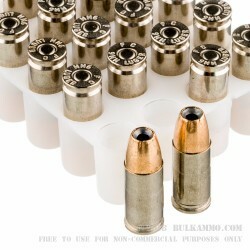 This ammo is loaded in nickel plated cases, while the other ammo is loaded in standard brass cases. Both are quality hollow points that are suitable for defensive purposes. 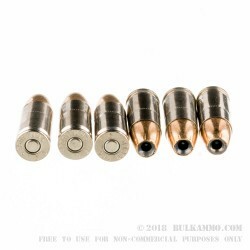 Q: How does the expansion on this compare (Soft hit) to some of the general Corbond Personal defense rounds, Thanks -Steve S.
A: The Cor-Bon DPX solid copper hollow points generally exhibit greater expansion than Federal HydraShoks.